DFINITY Stifung is the organization leading the research and development of DFINITY – the next generation block-chain computer protocol. Essentially they are building a public blockchain computer with unlimited scalability that uses algorithmic governance to evolve over time. 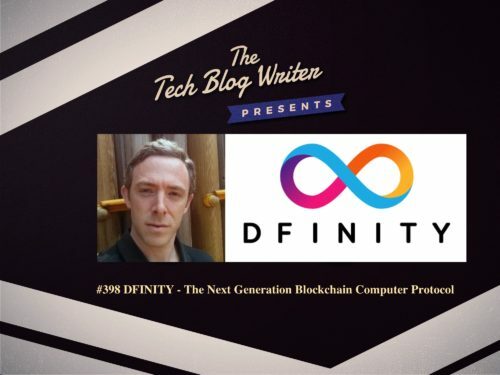 DFINITY is aiming to be the next big development in blockchain and designed to power a web 3.0 generation of applications such as decentralized alternatives to Amazon, Dropbox etc at a fraction of the cost of traditional operations. I invited Dom Williams onto the show to talk about the “Threshold Relay and Probabilistic Slot Consensus” which, when taken together, enables DFINITY to offer 3-5 second transaction finality – up to 150x faster than Ethereum and over 900x faster than Bitcoin. This will allow for virtually instantaneous interaction between clients whether it is in the area of financial transactions, file sharing or data transfer and documents it with code that cannot be hacked or modified by malicious third parties. Dominic is a crypto nerd. His recent novel designs include Threshold Relay and PSC chains, Validation Towers, Validation Trees and USCIDs, and he proposes new ideas such as The 3 E’s of Sybil Resistance . In a previous life he created a fast-growing MMO game using his own distributed systems that hosted some millions of users. On today’s show, we also discuss the current spate of ICOs and the introduction of high profile celebrities such as Jamie Foxx, Paris Hilton and Twitter scientists/influencers. As more and people begin discussing coins such as Ripple, Ethereum and LiteCoin or how to invest on Coinbase during the holiday season, we also talk about what warning signs to look out for. If you have any questions about today’s episode or want to appear on the podcast, please contact me directly. Next PostWhy are hedge fund groups turning to fintech alternatives for investment?